This post is my entry into the The Day That… blogger photo competition. We knew they were going to put something in the paper…the journalist had phoned earlier in the week for a chat…he explained that sometimes the editor cuts the articles short or cuts them out altogether. So we imagined that, at most, there would be a little snippet, perhaps a little filler article about our son Joshua. So when we went to pick up our copy of the local paper, this is not what we expected to see on the billboard outside. 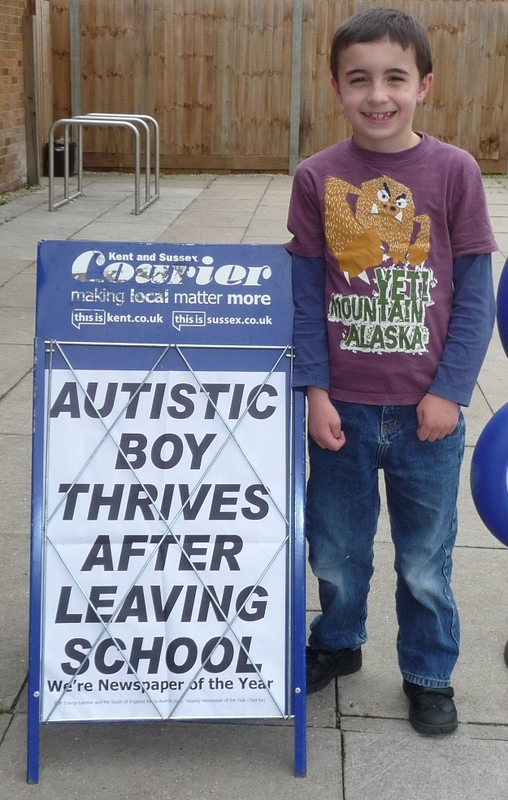 The paper had a full page article celebrating Joshua’s achievements since leaving school, whilst trying to overcome the daily difficulties he faces with having aspergers syndrome. For most parents, the camera comes out on a childs first day at school. Feeling proud of your son or daughter wearing their school uniform for the first time. For me, the camera came out to celebrate taking him out of school. It had taken over 18 months to gradually rebuild his confidence, to give him a sense of self worth again, to show him that we believed in him, even though his school teachers hadn’t. Somehow seeing it in black and white, made the significance of this special day all the more poignant. It marked the complete end of what had been an extremely difficult journey for Joshua and the beginning of a new adventure. This boy who had been written off by the education system and could easily have become just another statistic – part of the 91% of primary school children in our county who had been permanently excluded from their school due to having a special educational need such as ASD or ADHD. But Josh has been able to show the world that he has been able to achieve far more out of the school system than over a dozen teachers, experts and professionals could ever have achieved when he was in school. Joshua…we are so proud of you for who you are…well done!